OmniFormat is a free document conversion utility. It allows dynamic conversion and image manipulation of over 75 file formats including HTML, DOC, XLS, WPD, PDF, XML, JPEG, GIF, TIF, PNG, PCX, PPT, PS, TXT, Photo CD, FAX and MPEG. This program supports Optical Character Recognition (OCR). In order to convert image formats to text, the free OCR module must be downloaded from OmniFormat and installed. The OCR Module will process all import formats handled by OmniFormat. It can also extract text from PDF files and be run from the command line. 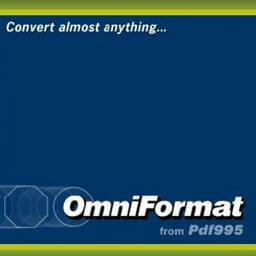 OmniFormat may also be used to dynamically convert XML data to any supported output format including PDF. A Microsoft Word file is used as a template to supply layout information. OmniFormat replaces fields in the Word template with values specified in the XML file. And then converts the document to the final format. Processing options include Size, Rotation, Brightness, Saturation, Hue, Contrast. OmniFormat includes HTML2PDF995, a utility for rapid, quality conversion of HTML to PDF and other formats. HTML2PDF995 may be called from other applications or run from the command line to quietly convert HTML to PDF. Note: The program requires that Pdf995 FREE is installed. Pdf995 is the fast, affordable way to create professional-quality documents in the popular PDF file format. Its easy-to-use interface allows you to create PDF files by simply selecting the “print” command from any application, creating documents which can be viewed on any computer with a PDF viewer. The free version will display a sponsor page in your web browser each time you launch the software. If you would prefer not to see sponsor pages, you may purchase a license key for either an individual or a workgroup. Supported 32 bit and 64 bit operating systems: Windows 10, 8, 7, Vista, XP. Citrix/Terminal Server, configuration as a shared network printer. Server 2003, 2008 and 2012. And Windows 95, 98, NT 4.0, 2000 and ME. Also Windows 95, 98, NT 4.0, 2000 and ME. Server 2003, 2008, 2012 and 2016. Citrix/Terminal Server, configuration as a shared network printer.